The 8000GS/48 is a low-cost managed stackable Gigabit Ethernet switch ideal for extending the port count at the edge of the network with stacking. 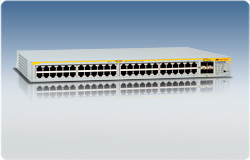 This cost-effective switch has an 1RU form factor, four Gigabit Ethernet SFP combo bays and dedicated stacking interfaces. An extensive set of features such as link aggregation, VLANs and port mirroring can be performed across the stack.